Published in the South Kent Gazette, 17 June, 1981. By the time it reached its 25th anniversary it was paying a dividend of 2s. (10p) in the £. Enterprise has always been a feature of the Society and many present members will no doubt be surprised to learn that at one time the Society owned its own schooner, which was employed on bringing house coal from the north-east ports. But, looking at some of the entries in the minute books of the period, one is compelled to wonder whether this was an entire financial success. The minutes bear frequent references to messages received from the master about repair jobs and so on, effected at different ports. The schooner was the Jas Simpson. One of the troubles mentioned in the minutes was the absence from the ship of the master while she was at Southampton. This caused a change of master. The committee appointed a Mr Sharp, of Tower Hill, who had formerly been the captain of the William Crundall. By 1959, when the Society, renamed the Dover and District Society in 1931, had just absorbed the smaller Deal Society. It had a membership of almost 20,000, and, according to its balance sheet, assets of more than £790,000. The book value of its properties alone was shown as £147,000, although the actual value was no doubt much higher. But it would be quite wrong to give the impression that this remarkable success has come easily. Old members can speak of days when members of the management committee have done all sorts of jobs, including delivery of orders, on a voluntary basis, to help the Society, and other times when they canvassed the town for new members in order to raise the funds to buy the Biggin Street premises. Men and women risked their life savings to help the development of the movement in Dover. For although the Society was obviously succeeding, it badly needed capital in the early days. Operations in Dover began as early as 1885 in a small shop in Market Street. Here, too, business was at once brisk, and, in succeeding years, so many extensions were made at the rear of the premises that they nearly reached New Street. There was no opportunity for lateral extension and eventually the Market Street shop became entirely inadequate for the business. So the committee purchased a plot of land in Biggin Street and, with the aid of some voluntary labour the older part of the present premises were built, the first part being opened for business in January 1889. Two years earlier, the Society had built a new store and bakery at River. Very soon the central stores in Biggin Street became, in their turn, too small and the Society began opening branches in various parts of the town. The first was at Winchelsea and others followed at Tower Hamlets, Cherry Tree Avenue and Elms Vale. The next move was a return to the countryside, where the Society had begun, for River was still regarded as a separate village in 1880. The Society opened a branch at Aylesham in 1929, and, long before the absorption of the Deal Society, there were other branches at Eythorne. Whitfield, Shepherdswell and Elvington. Kearsney Abbey, of which only a small wing remains and is used as a park cafeteria, was a charming residence, in extensive grounds, in which the two branches of the Dour unite, forming a lake, in which there are ornamental islands. The land was part of an estate of 11,000 acres which was bought by Peter Fector, a Dover banker, from Thomas Biggs, for £72,000 in 1790. It was Mr Fector’s son John Minet who built the “Abbey“ as it came to be known, for his home, and it was finished by about 1822. Some of the stonework came from old buildings in Dover which were demolished during road improvements, and some may have come from the old town walls. In the mid-1830s a large gothic window which had been found in Bench Street was dismantled and re-erected in the Abbey gardens. John Minet Fector was an MP for Dover for two years from 1835. The Minet family eventually disposed of the estate and it subsequently became divided. The Abbey remained in private ownership until the second world war when it was commandeered for use as an ATS establishment and the headquarters of No. 2 Searchlight Regiment. Then, in 1945, the Abbey and 25 acres of land was bought by Dover Town Council for £10,000. By that time the house was suffering from dry rot and it was not considered worthwhile to renovate the property. On the opposite side of the road from Kearsney Abbey, and adjoining the railway station, is Kearsney Manor which is now a convent nursing home overlooking a large lake fed by a branch of the River Dour. In the grounds, close to the Kearsney Abbey entrance is a large Roman Catholic Chapel which has been used for public worship. Kearsney Manor is the original Manor House, which, with the Manor lands, was held in the Norman times as part of the Barony of Saye, being a Knight's fee for the guarding of Dover Castle. After passing through many hands, at the beginning of the 19th century it was held by Mr Thomas Biggs, a revenue officer of Dover, from whom it was acquired by M. J. M. Fector, banker, of Dover, who, leaving the old manor house intact in 1822, built the Abbey on part of the manor grounds, using in its construction stones taken from the demolished walls of Dover. The Kearsney station is outside the borough boundaries, as is also the whole of the adjoining village of Temple Ewell. Westward of the Abbey is a large property called Kearsney Court. It is known that there was a Kearsney Court at the time of the Norman Conquest but the present building is of much more recent manufacture. In recent times it was the home of Mr E. P. Barlow, JP, a former managing director of Messrs Wiggins and Teape’s paper mills. Further westward is Bushy Ruff, and its picturesque lake — once a mill pond — frequented by water fowl, and Chilton Lake and water fall now known as Russell Gardens on the boundary of what was the building estate of Sir William Crundall, abutting on the Alkham road, from whence there is a pleasant footpath at the back of the Abbey to the River bus terminus. 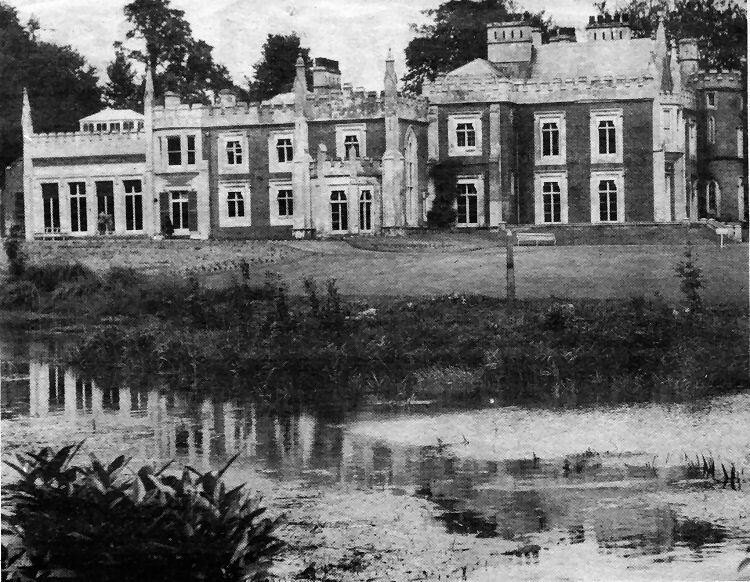 Built in the style of a medieval manor, this is how Kearsney Abbey appeared in 1949 before the greater part of it was demolished. The property was built by John Monet Fector who moved there to live, from the odd family home nearby, when the work was completed early in the 1820b. The property boasted 15 bedrooms and four bathrooms, and a great deal of the stonework is believed to have come from the old town walls, gateways and buildings demolished for road improvements. Shortly after the end of the Second World War the Town Council bought the Abbey and 25 acres of land for use as a public park for £10,000. By that time the main building was not thought to be worth restoring. During the war the property was commandeered by the military authorities. One of the distinguished owners in the 19th century was Joseph Churchward, who operated the mail packet service between Dover and the Continent in the 1650s. He was a member of the Town Council, rising to become an alderman and mayor and was a local magistrate. To keep his fleet of ships in good repair Mr Churchward established the Dover Packet Yard near the docks. He exercised considerable political influence in the town.